In a Nutshell: Credit Sesame is a financial information resource that provides members free credit report cards. Anyone can become a member and get continuous access to and updates about your credit — at no cost. The site gets information from TransUnion and then breaks down your credit score for you, so you understand what factors go into it. Credit Sesame is much more than a simple tool for credit assessment; it also offers educational blog posts and research focused on credit-related issues. On a mission to empower individuals to improve their own finances, Credit Sesame recommends steps to consolidate debt and expand your financial profile. Schooling is supposed to prepare kids to enter the adult world, teaching them math, science, social studies, and language arts — but all too often the educational system glosses over financial subjects. We’re taught the quadratic formula, but not how to handle credit. So, when it comes time to join adulthood and build credit, there’s often a knowledge gap holding people back. In 2012, a survey found that 60% of respondents between the ages 18 to 34 didn’t know what their credit score was. Financial avoidance seems to be a trend for some young people. In 2016, Credit Sesame reported that 60% of Millennials surveyed professed not owning a credit card at all. These statistics indicate that a majority of this generation isn’t as prepared or capable as it could be to make informed financial choices. Part of the issue, surely, is not being educated on the importance of credit or how to handle a credit card. Millennials have grown up with access to anything they need to know at their fingertips, so it’s only right that an educative force in the credit sector should reach out to them from online. Credit Sesame is a website with insights and recommendations that help get its members on a healthy financial path. 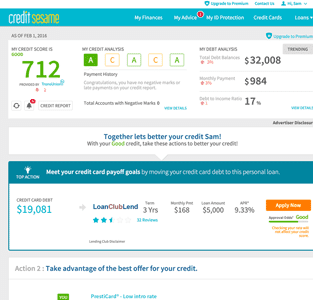 Credit Sesame grades your payment history, credit utilization, credit age, account mix, and credit inquiries. 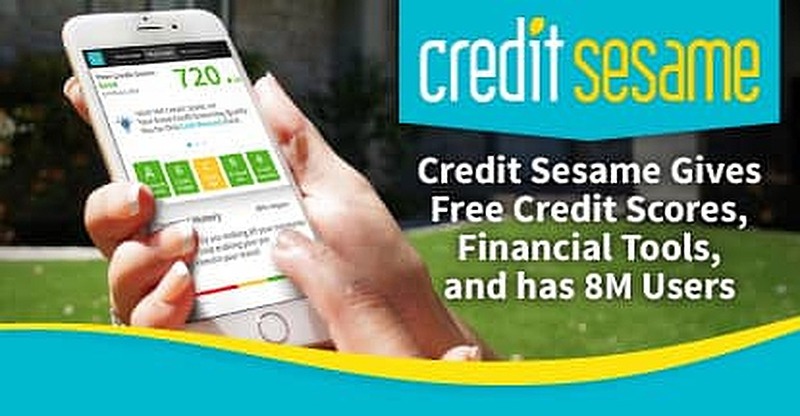 Through free credit report cards and information, Credit Sesame increases the financial awareness of its 8 million members. The site engages its audience on a personal level in making targeted recommendations on anything from how to manage credit cards to how to consolidate student loans. Founded in 2010, the young but fast-growing company serves as an overall resource for financial information such as debt management. There are no trial periods and no expiration dates for your free account — Credit Sesame is 100% free to use as a learning tool for as long as you like. It’s also available on any iPhone, Android, or Kindle via the mobile app. With a Credit Sesame account, financial tools and knowledge are always close at hand. The site specializes in providing free credit report cards and personalized analysis of credit. Members are graded on the five factors that determine credit scores: payment history, credit utilization, credit age, account mix, and credit inquiries. The aim of all this free information is to get individuals ready and able to take control of their own finances — that could mean anything from better debt management to becoming more financially fit to get approved for a loan. Whatever your stated financial goals are, Credit Sesame endeavors to provide tools to help make it happen. A detailed credit report card uses the data points from credit reports to help members achieve their financial goals. Every aspect of this site is hyper-targeted to individual needs. When you get an account, you set financial goals that let the site’s analysts know what to suggest for you. These experts know that the concerns of someone looking to pay off student loans will be different than those of someone looking to re-mortgage a house. 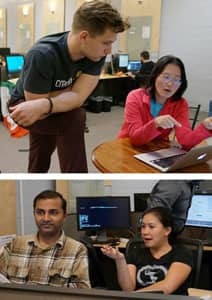 While pointing out what you can do better, Credit Sesame also monitors your credit report as a preventative measure against identity theft and fraud. The site keeps close tabs on your credit for you. A trending graph will track your progress over the months so you can clearly see how your behavior is impacting your score. To join Credit Sesame, prospective members can apply online, inputting basic details for their profile such as their name, Social Security number, and address. This will be sent to TransUnion to verify the new member’s identity. A four-digit PIN on the app safeguards all data. In clear and specific terms, Credit Sesame breaks down your credit report. Credit Sesame employs industry standard practices to protect personal information on the website. Once signed up, you’ll receive your score for free, and you can also view how much you owe, your home value, and any stats that lenders see. This snapshot of your credit is updated each month and can be checked from either a mobile device or desktop. Getting its information straight from TransUnion, Credit Sesame dissects the important aspects of a credit report for you. On a straightforward webpage, you’ll see what your creditworthiness is and what areas have the potential to improve. If you like your free account and want more features, you can always upgrade to a paid plan. In addition to the free plan, three variations of premium products are available: the Advanced Plan, the Pro-Credit Plan, and the Platinum Plan. These offer extra perks for a monthly fee. As we’ve outlined, anyone can sign up for a free account with Credit Sesame and get one complimentary credit report card per month. The credit report will come from TransUnion. The site will take this information and analyze it for you. Free account holders also receive credit monitoring and alerts. Besides the free account, this is the cheapest option at Credit Sesame. The Advanced Plan comes with a free report, as all plans do, and features basic credit monitoring. The benefits of this plan include one-bureau daily checks, three-bureau monthly checks, and a three-bureau full credit report. If you want a more thorough look into your credit than the free report card, try out this plan for only $9.95 a month. The Pro-Credit Plan includes everything you get with the free account and Advanced Credit Plan but adds basic identity protection. With this plan, members get three-bureau credit monitoring with full credit alerts as well as 24/7 access to live experts who can assist with credit report inaccuracies. The Platinum Plan is as good as it gets. For $19.95 a month, you’ll get full identity protection — that’s including $1 million identity theft insurance. For members of this plan, live financial experts are available 24 hours a day to help deal with a lost or stolen wallet. This added 24/7 protection brings much peace of mind. Additionally, with black market website monitoring, public records monitoring, and Social Security number monitoring, members of this premium plan can rest easy. Credit Sesame proactively provides ways for members to save money and increase their financial capabilities. Through offers, recommendations, and individualized information, the site empowers people to handle various credit situations. Credit Sesame experts can explain complex credit issues. The Credit Sesame Daily blog posts articles every day to promote best practices and explain financial terms in simple language. Leading thousands of readers to financial wellness, the blog outlines topics like what a good credit score is and how to refinance student loans. The blog has hundreds of helpful articles discussing savings, debt, loans, and trends in the financial sector. Credit Sesame is dedicated to making information easily accessible, so members can educate themselves about crucial financial matters. The Expert Corner highlights the latest credit news and provides guidance for readers. Credit expert John Ulzheimer offers commentary on the day’s news and overall financial situations, drawing on his experience to assess what it means for consumers. On a member’s profile, Credit Sesame makes further recommendations that are specific to that person’s credit history. Taking up where your schooling left off, Credit Sesame informs people about how credit works. Whether you’re a Millennial who doesn’t know how to start building credit or a Baby Boomer who wonders how to use a credit card to save money, Credit Sesame fills the gaps in anyone’s financial education. The site’s free credit report cards let members know where they stand and what they can do to improve. As a loan management resource, Credit Sesame has assisted millions of consumers on the path to financial wellness. Its premium protections and specific guidance help anyone online learn and grow.